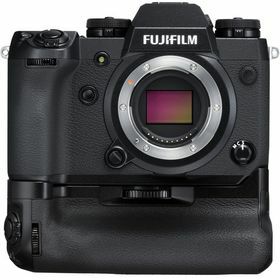 Offering plenty of features inside a durable magnesium alloy housing, the X-H1 Mirrorless Digital Camera from Fujifilm aims to position itself as a leading option for professional video and photo work. Equipped with a 24.3MP APS-C X-Trans CMOS III image sensor and the X-Processor Pro Engine, this camera allows you to capture high quality imagery quickly and with low noise at sensitivities up to ISO 51200. A major implementation is an in-body 5-axis image stabilization system, a first for X Series cameras, which can compensate for up to 5.5 stops of shutter speed to create sharp imaging even when little light is available. [Full HD (2048 x 1080)] 24p / 23.98p 100Mbps / 50Mbps up to approx. 20min. [Full HD (1920 x 1080) High speed rec.] 120p / 100p 200Mbps up to approx. 6min.